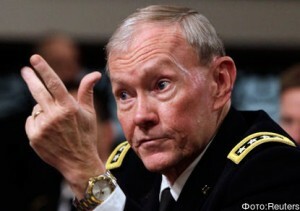 On June 4 a portion of a report by Army General Martin Dempsey, the chairman of the US Joint Chiefs of Staff, was declassified, in which he claims that Washington is considering deploying cruise missiles with nuclear warheads in Europe as a response to Russia’s alleged “violations” of the Intermediate-Range Nuclear Forces Treaty, or INF, which the United States and Soviet Union became party to back in 1987. Four days later a similar statement was made by British Foreign Secretary Philip Hammond, who announced London’s willingness to once again accept US nuclear missiles, which were removed from British bases in 2006. In so doing, the United Kingdom has joined those who are criticizing Moscow for an “offense” that the Russians have never committed at any time or in any place. Russia’s next-generation intercontinental nuclear ballistic missile mentioned by the US (the RS-26 or Rubezh) has a range of over 5,500 kilometers and is also not subject to the INF’s restrictions, since that treaty does not apply to nuclear intercontinental ballistic missiles with a range of over 5,500 km. The numbers of those missiles are to be reduced principally through other agreements, such as strategic offensive reductions treaties. Washington launched an extensive propaganda campaign a few years ago to discredit Russia in response to some type of INF “violations,” but has not yet provided any evidence of such “violations” by the Russians. That was the situation in January, July, and November of last year, when US officials made unfounded allegations in this regard against Moscow. And the same scenario is being played out again this year. The question arises: why does Washington need to create a manifestly counterproductive drama around some pseudo INF violations by the Russians, and particularly by resorting to a range of threats that have never before been issued in such a bombastic way? The main reason is that the US is trying to prevent Russia from developing two effective missile “antidotes” to the American system to intercept ballistic and cruise missiles – Moscow is developing a new cruise missile and a next-generation intercontinental nuclear ballistic missile capable of challenging the high-tech US missile-defense infrastructure. Washington wants to be able to deliver a first nuclear strike against Russia, China, Iran, and other states without fear of reprisal, with an eye toward creating a future world order. After all, the Pentagon is retaining its offensive doctrines unchanged that allow for a first preemptive or preventative nuclear strike. The second compelling reason why Washington has decided to trot out this improbable accusation about Russia’s INF “violations” is that the US itself has already repeatedly violated and continues to violate that treaty, when it uses “shorter-, medium-, and intermediate-range” ballistic and cruise missiles as targets to test its missile-defense systems. In particular, target missiles are being used such as the Hera (with a range of 1,100-1,200 km. ), the MRT-1 (with a range of 1,100 km. ), and the LRALT (with a range of 2,000 km.). 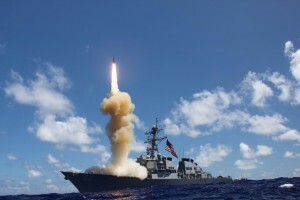 Another example of Washington’s violation of this treaty will be if they install land-based cruise missiles in the launchers of the American missile-defense systems in Romania and Poland (that will become operational in 2015 and 2018, respectively), which can be equipped with a total of 48 missiles (24 missiles each). The Associated Press rightly notes that the potential return of American medium-range missiles to Europe, as mentioned by Army General Martin Dempsey, is reminiscent of the darkest days of the Cold War. And that’s true if we take into account the fact that, as the AP points out, the White House is considering three options for its military response to Russia’s INF “violations”: developing defensive, i.e., anti-ballistic systems; launching a preemptive “counterforce strike” against any weapons that violate the treaty; and using “nuclear weapons to destroy military targets” on enemy territory, meaning inside Russia. But that would be a direct violation of that treaty by the United States itself. How should Russia proceed, given the fact that the United States is actually in violation of the INF? Should she also decide to use “nuclear weapons to destroy military targets” on enemy territory? How should Russia respond if Washington still maintains a significant strategic offensive nuclear arsenal in order to preserve its “breakout potential” and also includes Russia in the list of countries that may be subjected to a nuclear first strike? What responsive measures is Russia entitled to employ if the US refuses to remove its tactical nuclear weapons from Europe or to dismantle their infrastructure, when it is the only country in the world that has been continuously deploying its tactical nuclear weapons in other states since the early 1950s? What should Russia do in order to strengthen its own security and that of its allies, if the United States continues to enmesh the globe in a network of offensive weapons and the information- and intelligence-gathering tools of its missile-defense system by combining it with nuclear missiles and conventional weapons? How should Russia respond when the military potential ensconced in the European component of US missile defense is many times greater than what would be needed to neutralize any existing or potential missile threats to European countries? Since the creation of American missile defense violates the INF and New START (2010) treaties, naturally Russia has the right to respond by deploying new weapons that are able to neutralize the potential of the US missile-defense system. How should Russia act if the US and its allies quash any initiative aimed at preventing the introduction of weapons into outer space? The Russians could legitimately demand answers from Washington to many similar questions. They could easily amass at least another dozen or so bona fide grievances. It is perfectly obvious that Moscow has to demonstrate its willingness to act in the event of an INF violation by the United States, as well as to promptly and appropriately respond to the Americans’ destructive approach to resolving many other arms-control issues.